I can’t take credit for this idea. I read it somewhere many months ago and have been wanting to try it in our home. 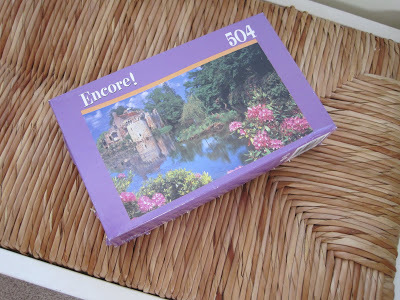 Last week I purchased a couple of puzzles, one at the Dollar Tree and one at Goodwill. I’m setting up a space in our living area where we can have a puzzle out all the time so that anyone can stop to work on it as they wish. Right now it’s sitting on a small wooden table. 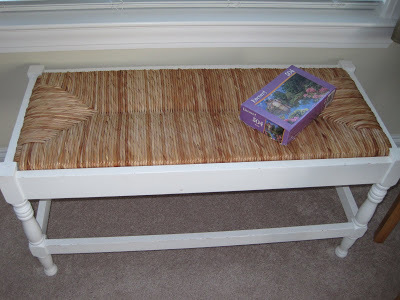 My goal is to find a large, decorative tray that I can place on the bench under our window. (I’m hoping a few visits to Goodwill can provide me with one!) We hardly ever use the bench for seating and, if the puzzle is on the tray, we can move it to different locations as needed. The girls and I spent a couple of nights getting the outer pieces put together. 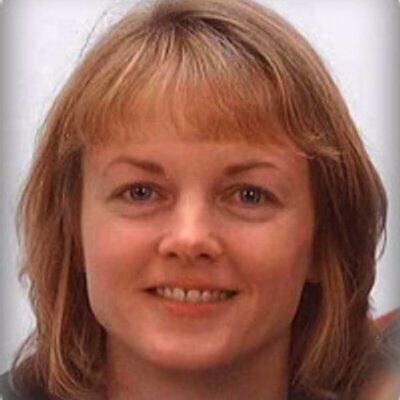 I think it will be a bit harder to complete the rest, but I’m hoping to promote family unity – along with a little entertainment – as we work on accomplishing this project together! I hope you all have as much fun as I did! I haven't done a puzzle in what must be close to ten years. It kind of sounds fun. My older two children love to do puzzles, so I think this will be a hit at our house when they get older and can do "real" puzzles. Thanks for the suggestion! I've always loved doing puzzles … one of my favorite childhood memories is the on-going puzzle that my grandparents always had going on the back porch table! 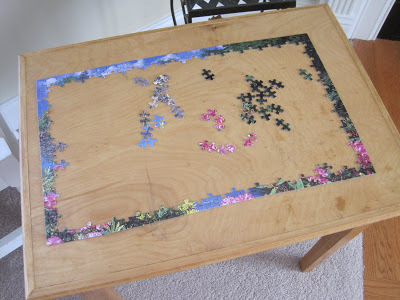 I don't have a good place to leave a puzzle out for long, but the tray idea is wonderful! Will be scouring the thrift shops and garage sales this summer for just the right one … fab idea!